After being humiliated by bullies, eleven-year-old Lucas Phelman is given a strange watch with bizarre effects. Eleven-year-old Lucas Phelman knows he’s found trouble when middle-school bullies surround him on the way home from school. In just a few moments, he transforms from the bravest space cadet in the galaxy (at least, in his imagination) to a loser in a garbage can. Adding insult to injury, they take a video of the humiliating event and post it on the Internet for the entire school to see! Hiding the truth from his mother, he accepts a gift left to him by his absent father. The strange-looking watch fits securely on his wrist. But, he discovers wearing the watch causes bizarre things to happen. His imaginary world follows him into reality, along with odd animals and the ability to destroy them! Lucas must trust a mysterious creature that controls the watch — a device that can transport him to Kalaria, a place where nothing is as it seems. 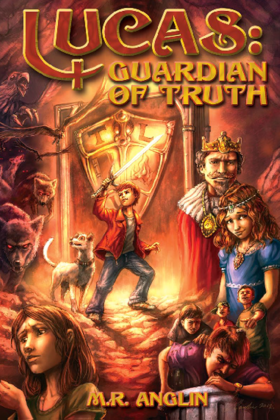 There, Lucas learns that he is the Guardian of Truth, destined to save Kalaria from the Mind Master, a creature bent on destroying the planet, and imagination along with it. But even Lucas, with the strongest imagination of all, isn’t powerful enough. He learns of a powerful tool, the Book of Truth, which he must find and master its use to defeat the Mind Master for good. But how to find it? And, is he brave enough to try? If he fails, Kalaria is doomed … and the Earth is next! Lucas is a lonely kid with a big imagination. Then one day, the things he imagines start coming true. Strange creatures appear and watch him. A dog appears out of a wristwatch. And still his mother doesn’t believe him. Later on, Lucas is taken to a parallel world where people “imaginate” all kinds of things, from buildings to weapons. But the Mind Master threatens the entire world and has already engulfed most of it in thick, velvety darkness inhabited by monsters. Only the Guardian of Truth can repel the darkness and restore the world to its proper state. This is a fun, middle-grade read. I was reminded alternately of Ben Ten and The Green Lantern, because of the way the imagined things are explained (hard-light constructs). Lucas and the princess, Sariah, are clearly characterized and fun to follow as they encounter the darkness, monsters, and the Mind Master. Toward the end, the Christianity gets a bit heavy-handed. I felt that it made the story predictable. But I’m much older than the intended age group. An 11-year old boy would eat this book up and beg for more. It has lasers, dragons, talking pets, and kids who save the day. What’s not to like?